This page answers some frequently asked questions about ILDA. For a deeper discussion, you may also want to see additional information about ILDA's power and limits as a trade association. A: No, ILDA does not require sponsorship. It is illegal for U.S.-based trade associations such as ILDA to require sponsorship or similar prior approval by existing members. This is because existing members could conspire to keep competitors out of the trade association. A U.S.-based trade association must be open to all who meet reasonable, non-restrictive membership requirements. In any questionable cases, the ILDA Board can review and approve memberships as per the ILDA Bylaws. Please see the ILDA Membership Requirements page, which is at the separate ILDA Member & Event Management website. A: All ILDA Members are bound by the ILDA Code of Ethics and Code of Business Practice, and acknowledge the Lasershow Safety - Basic Principles document. We make this clear to new members. If an ILDA Member violates the Codes or Principles, then anyone (the general public or another Member) can file a complaint with the ILDA Ethics Committee. Hopefully, unethical or unsafe companies will not want to deal with potential Ethics Complaints, and will decide not to join ILDA. While this is not a perfect system to guarantee all transactions with Members, it does provide some protection. It is a useful way to have an impartial body — the Ethics Committee — work to resolve any problems with an ILDA Member. For more information, see the Consumer protection page. A: Not necessarily; these are two different things. An ILDA Accredited Professional Lasershow Company has met certain requirements about length of time in business, number and size of laser show jobs, industry knowledge and participation, and safety training. This is not an easy process. Companies that have received ILDA Professional accreditation definitely have significant, documented experience in doing laser shows. 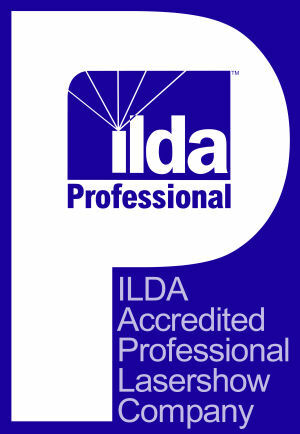 Note that any lasershow company can apply for ILDA Pro -- the accreditation process is separate from ILDA membership. ILDA membership, in contrast, is open to any company or person agreeing to our ethics and business practice codes, who affirms basic safety knowledge, and who pays dues. It is easier to be an ILDA Member than to be an ILDA Accredited Professional Lasershow Company. A: Simply check our online Membership database. You can search using various criteria such as company name, location, type of Membership, etc. to find if a specific company is a Member. A: ILDA welcomes all types of laserists. Often, you can tell something about the size of a company by reading the description they submitted to the online Membership directory. Of course, you can also visit their website to get a feel for past projects and staffing levels. Also, for ILDA Corporate Members, ILDA dues are based on the company's stated annual billings for lasershow sales. There are three dues levels, for companies billing over USD $1,000,000; companies billing between $250,000 and $1,000,000; and for companies billing below $250,000. A: ILDA is a trade association, to help promote companies involved in laser shows and displays. We do not make or certify products. • To find out if someone is an ILDA Member, check our online Membership directory. Current Members are allowed to display an ILDA Member logo on their websites and other marketing materials. We provide two layouts on the ILDA Member logos page; both have the ILDA logo plus the word “MEMBER” or the Membership level. • ILDA has developed certain technical standards. If a product meets those standards, any company (member or non-member) can claim in general terms that the product is "ILDA compatible" or "meets ILDA standards." It is up to the company as to whether this is true or not. -- If the company is an ILDA Member, and the product does not comply, then anyone can file a complaint with the ILDA Ethics Committee. -- If the company is not a member, please contact ILDA and we will try to get the company to stop with any false claims. • ILDA's logo is only used for association business. The ILDA logo is not to be used by anyone, Member or non-member, to indicate products that claim to meet ILDA standards. For more information about possible fraudulent ads and scams, click here. We also have information about permitted and forbidden uses of the ILDA logo. A: ILDA dues do NOT run from the first time you pay dues until one year later. Instead, ILDA dues run from Jan 1 - Dec 31 of each year. If you join in mid-year, you pay only partial dues. If you join towards the end of the year, you get a special deal with the rest of that year and the entire next year. Otherwise (if you are currently or recently a Member) you pay dues for the period January 1 - December 31. For new members joining in mid-year, the dues are prorated. This means that the later in the year you join, the less you pay for that year. (For example, if you join on July 1, the dues will be approximately 1/2 of full-year dues.) Once your new member renewal comes up at the end of the year, then you will be asked to renew for Jan 1 - Dec 31 of the upcoming year at the full year dues cost. For current ILDA Members, they are asked to renew at the end of each year; for example, at the end of 2017. The renewal is good from January 1 through December 31 of the upcoming year (2018 in the example). Note that it does not matter when during the year the Member pays. Even if they do not pay until later in the year for some reason, the full year dues are still owed. This is to prevent existing Members from delaying their payment in order to not pay full-year dues.